Hot off of last year’s heartfelt sci-fi hit Arrival, director Denis Villeneuve returns to the same genre once more but this time, he has his sights on something even more ambitious: a direct sequel to one of the genre’s most influential and visually quoted works that comes 35 years after the original. 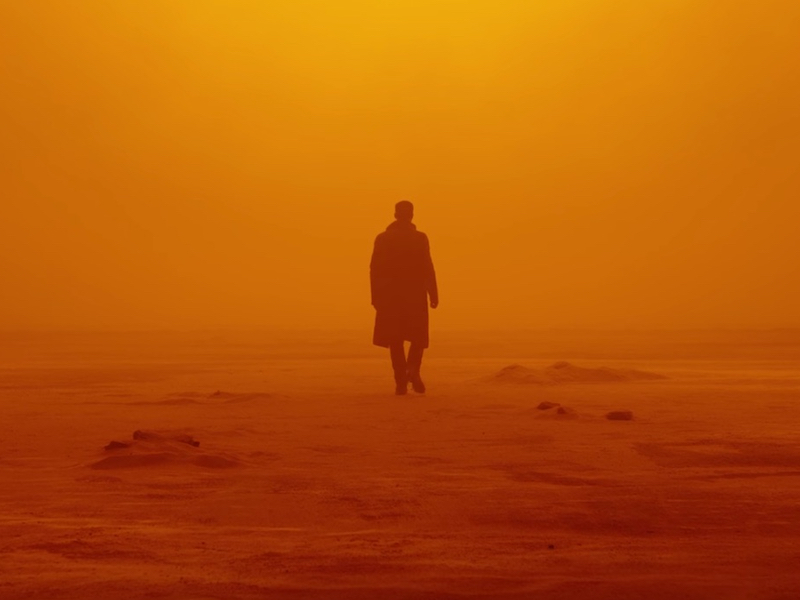 Given how much could have gone wrong, it’s remarkable just how much Blade Runner 2049 gets it right, from its flawless production design to its nuanced storytelling that muses on the same existential themes that ran through the 1982 future-noir classic. This is an awe-inspiring follow-up that further expands Blade Runner‘s already vast scope to a futurescape with dazzling depth and a grandeur without rival. The story follows sullen LAPD detective K (Ryan Gosling) as he carries out his duty as a Blade Runner by tracking down a class of older generation Replicants (advanced robots made to look identical to humans) and “retiring” them as their very existence is illegal. After a visit with one such Replicant, he discovers a chest buried deep in the ground (with the help of a handy drone that detaches from the roof of his car) that leads him on an investigation that could have cataclysmic ramifications on the relationship between man and machine. His search for answers pits him against tech mogul Niander Wallace (Jared Leto) and his Replicant enforcer Luv (Sylvia Hoeks) while eventually leading him to legendary detective Rick Deckard (Harrison Ford), who’s been in hiding since the events of the first film. Even more so than its predecessor, Blade Runner 2049 is a thorough and intentionally paced detective story that uses its futuristic setting to further deepen the mysteries at the heart of its story while adding a layer of insight into how humankind may look 30 years from now. Among the film’s most prevalent themes is that which speculates humankind’s relationship to artificial intelligence and what we deem as “real” or “unreal”, whether it be a Replicant or an interactive advertisement or a sophisticated computer simulation meant to mimic human behavior. The role of Joi played brilliantly by Ana de Armas is the most consistent evocation of this concept, as she is characterized as the most empathic and understanding presence in K’s life despite the fact that her translucent appearance is a reminder that she is ultimately a collection of light dictated by 0s and 1s. The nimble and seamless effects work is always first-rate, whether it is utilized in small ways like the depiction of raindrops falling softly on the hands of a hologram to the larger scale uses that bring the urban monoliths and pyramids of the first film back to life again. The production design is just as meticulous and makes every space feel like something we’ve never seen before and yet completely believable at the same time; I was struck in particular by the layout of Wallace’s office, whose minimalist wood-based configuration both looks stunning and reminds us that this world’s scarcity of trees means that a room like his could only be afforded by someone of great means. All of this is framed with the excellence of all-time great cinematographer Roger Deakins, previously nominated for an Oscar in his field on 13 different occasions and if there’s any justice, he won’t go home empty-handed next February. Ryan Gosling continues his streak of seeking out challenging roles that still play to his strengths as a performer and here, he works off the baseline stoicism that we’ve seen from his roles in Nicolas Winding Refn’s films but adds notes of longing and warmth to his role. Similarly great is Ford, who, despite his more limited screentime in this movie, may actually give a better performance here as Deckard than he did in his first occasion playing the grizzled gumshoe all those years ago. Blade Runner 2049 is proof that sequels can be so much more than a retread of their source material and with the right minds at work, they can even supersede the legacy of the original.